The chase was over. Not that his talents had been in any way tested. Now the hunter was free to express his control in whichever way he desired, to revel in his own power - and he already knew precisely how to enjoy it most. Taking wing with his tiny victim clutched to choking point in his talons, he soars high into the heavens, far from the safety of his prey's comfort zone. The flight presents welcome opportunity to embrace the anticipation, quietly contemplating the delight of what awaits as he climbs into the twilight sky, the last of the day's sun glinting in his eye as he nears his familiar destination. There, on a cold grey clifftop, he spreads his huge wings and swoops to a composed landing, his toy still clenched tightly in his grip. He smiles as he casts his eye down to his favourite spot - a soft bed of moss perched on the cliff's edge, the dry green surface conspiciously stained in spots with the memory of little lives gone by. In one calm motion, he opens his talons slightly to let his victim drop onto the moss, then spreads his talons to place his foot gently on top of its body. The tiny bird emits a squeak as the weight plants, pinning its torso into the ground. The eagle gazes down, his smile growing as he feels his muscles raising his other leg, his veins pulsing as he slowly draws his left foot into position above his victim's terrified face. He pauses. Just for a moment. Savouring the silent eye contact. With that, he thumps his foot onto the bird's head. Unmoved by the sharp shriek beneath the pads, he immediately raises his right foot and stamps it onto the body, before lifting his other foot again from the victim's face, ready for another blow. Establishing his rhythm, he proceeds to trample the little creature, letting his toes clasp the cliff-edge after each stamp to help squeeze the bird into the floor. His legs become a machine, raising and thrusting down with unerring discipline. There will be no respite now. The moss offers only a scrap of protection for the tiny bird's delicate body as the heavy predator pounds it into the unforgiving rock, with nothing and no-one to stop him. 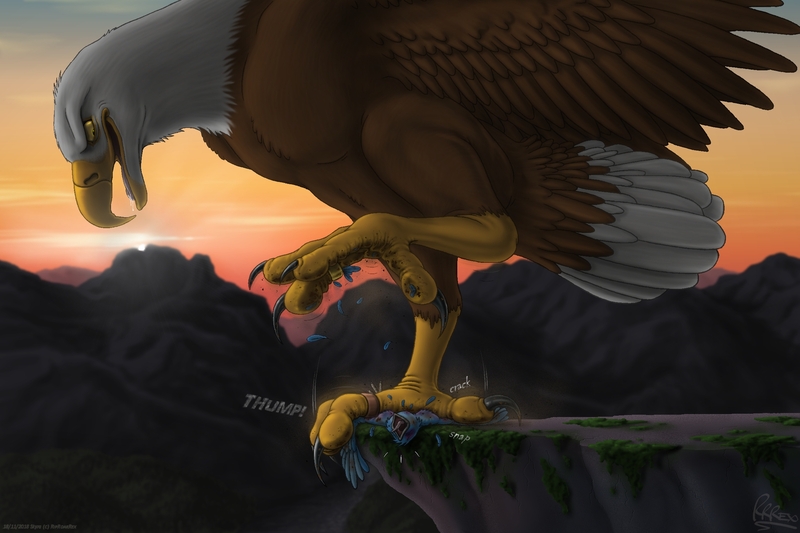 Far above the rest of the world, the still dusk air pulses only with the firm, steady thumps of the eagle's big feet, the feeble squeaks of his victim, and the soft, gentle crack of bones. Comforted by the sensation of his cruelty at work, the hunter ponders for a moment as to whether he will ever tire of killing in this manner. But as his prey's cries fade away, as he feels the ribs cracking beneath his toes, as the soft moss begins to squish with warm moisture, he knows the truth. He would never have it any other way. If you've not seen it elsewhere already, here's my first new pic for over a year. Astonishingly, it's also my first new fetishy picture of Skyra in almost a decade. I'm neglecting some of my characters badly. Lots more blurb about the production and background to this piece on my FurAffinity page if you're interested, but I won't clog this post up with all that guff. More room on the screen for talons that way. Hopefully more art on the way in the not-too-distant future! Golly! l sure do love the predator‑prey relationship! That was a fun read. And, those are some nice muscles on that bird. Heh! I presume by that you mean messing around with formatting on your posts? I've always done that. Just a stickler for presentation. Thanks very much! I've likely exaggerated the muscles here but I like the suggestion of power that they give.